Way back in 2003, long before the concept of a multi-core CPU had even entered the mind of AMD and Intel, Asus did what was hitherto considered impossible and made a motherboard that could overclock a pair of Xeon CPUs. That board, the legendary PC-DL, was not only groundbreaking due to the massive amount of performance it could unleash when overclocked, but also because it had been designed with enthusiasts in mind. For example, unlike most dual-processor motherboards back then, the PC-DL had an AGP slot for a gaming graphics card. The PC-DL wasn’t just popular with enthusiasts though, it was embraced by businesses too, as it allowed you to buy cheaper mid-range Xeons and overclock them to produce similar or better performance than the far more expensive high-end Xeons. As a measure of its success, the PC-DL is still being used and modded by overclockers today, as the still active 376 page, seven year old forum thread on 2cpu.com shows. Although Asus did produce a follow up, the NCCH-DL, it wasn’t nearly as good an overclocker as the PC-DL, so quickly faded into oblivion. Later on, in 2008 Intel also tried making an overclockable dual-processor motherboard, the D5400XS, aka Skulltrail; but it was hampered by the poor choice of FBDIMM memory and a basic BIOS. 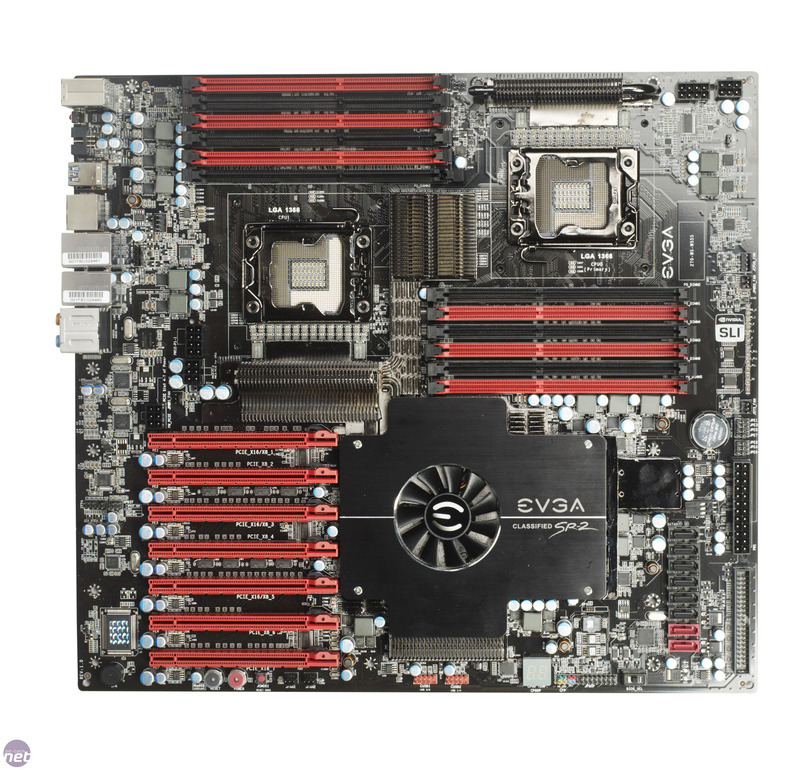 Enter stage left EVGA, a company already known for producing hideously expensive enthusiast motherboards and graphics cards, but with no experience in making dual-processor motherboards. Like the PC-DL, the EVGA SR-2 has been designed with enthusiasts in mind and so supports overclocking and multiple graphics cards. 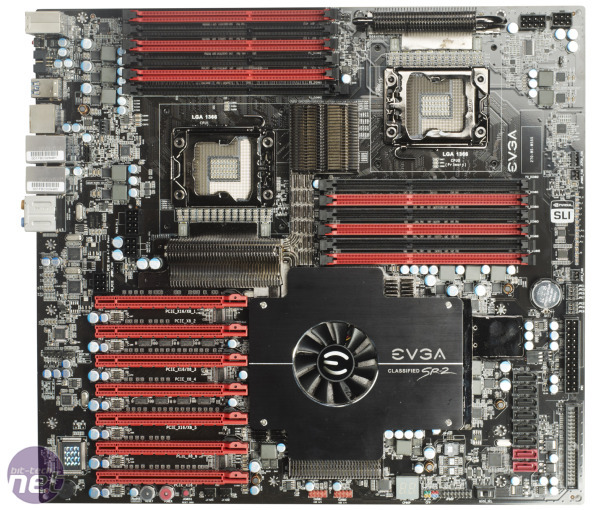 In point of fact, the SR-2, nicknamed the ‘Super Record 2’, has seven 16x PCI-E 2.0 slots. These are powered by a combination of the Intel 5520 chipset and two Nvidia nForce 200 PCI-E controllers. As a result the slots support two different configurations. In the first configuration the slot furthest away from the CPU sockets provides 16 lanes and the remaining six slots eight lanes each. In the second configuration slots 1, 3, 5 and 7 (counting away from the CPU sockets) each provide 16 lanes. This means the SR-2 is perfectly equipped to support four dual-slot graphics cards, for either 4-way SLI or quad CrossFireX in games or four cards running Folding@home. Although the SR-2 sports a pair of LGA1366 processor sockets it doesn’t support standard Core i7 CPUs. This is because these CPUs only have a single QPI link, which used to communicate with the chipset. Instead you’ll need a pair of CPUs from the Xeon 5500- or 5600-series’ as these processors have two QPI links, one to communicate with the chipset and one to communicate with the other CPU. What makes the SR-2 unique among dual-socket LGA1366 motherboards is that the BIOS has the ability to increase the QPI frequency beyond the stock 133MHz, thereby overclocking the CPUs.